Looking back, I think it’s my brother’s fault. It must have been around 1996. In those days, Mike and I sometimes bonded by watching television together. I can still remember weekend mornings lounging in our preferred spots on the white leather couches my parents had in the playroom. I think we were watching the Discovery Channel show Eco-Challenge, engrossed as the teams competed in feats that neither of us could ever imagine achieving. Like a lot of little siblings, when I wasn’t being annoying, I was more than willing to be a sounding board for whatever knowledge my older brothers wanted to pass on to me. For whatever reason, Mike thought it was the setting perfect for telling me all about the 1996 Everest disaster. Mt. Everest. Courtesy of Wikipedia user Lloyd Smith. We’re native-born Floridians. Our family has been in the sunshine state since the mid-1950s, so our experience growing up was very Florida. At that age, I could probably count the number of mountains I’d seen on my fingers, and altitude was as foreign to us as cold weather – something that we only saw on TV. This story Mike was recounting about death and drama at 29,000 feet was so far beyond my limited life experiences that it was nearly incomprehensible. The idea that anyone would want to climb a mountain knowing that it might cost them their lives? Impossible. I couldn’t imagine wanting something the way those climbers wanted Everest. I couldn’t understand pursuing a dream to your death. I still can’t understand that drive, and maybe that’s why I find myself drawn to stories about Everest. Every few months, I unexpectedly and without warning launch into a period of Everest research. I read news articles and blogs. I obsess over the tragic accidents, even the ones I’ve already read about a thousand times. I delve into the histories of the people whose bodies have been left on the mountain, I cry over the stories of the difficult choices made in the Death Zone, and I follow every link listed in the footnotes of Wikipedia articles. I read and I read and I read, but the one thing I can never really understand is: Why? You might think that’s strange. I’m the kind of person who loves hiking and is willing to force my body to complete 50K in one day. I like to push myself to my limits. I’m even willing to concede that some of my interests might lead to injury, but I’m not interested in killing myself in pursuit of my pastime. I’m not even all that invested in chasing summits. Spoiler alert: This isn’t Everest. Don’t get me wrong, it’s cool to get to the top of a mountain, even the comparatively short 6,684-foot elevation found in the Appalachian Mountain range, but I’ve always been more interested in the entire loop, from start to finish. Maybe it’s because I’m from such a flat part of the country and first learned to love nature at sea level. Whether I’m hiking up a mountain, urban hiking across the city, or cross-country hiking in my hometown, I’m usually happy with the journey. With the 2016 Everest climbing season recently coming to a close, this mountain has been on my mind (and in my dreams) even more than normal. I find myself on a weird loop where I start reading about a recent climber and the next thing I know three hours have passed and I’m neck deep reading about Beck Weather’s miraculous story of survival. How many people have succeeded in summiting? Who has died in their attempt and why? What happens to the people left behind? I had my nose pressed to my phone, reading article after article about Everest, as I waited in Dulles airport to fly to Seattle at the end of May. It’s embarrassing to admit, but I’ve left the U.S. more than I’ve visited our other coast. There was a memorable trip out West to New Mexico, Arizona, and Colorado in the summer before ninth grade, but that was it. I’d always meant to make another journey to the West Coast but there was never an opportunity. Thankfully, I’m on the wedding circuit, and the nuptials of Courtney, one of my close college friends, was the best reason ever to make my way to the Pacific Northwest for the first time. Even better, another close friend from college, Becky, moved to Seattle a few years ago and she offered to play host and tour guide for me and our friend Mindy while we were in town. My picture is basically a postcard. Through the magic of Instagram, I spend a lot of time looking at photos of the Pacific Northwest, but seeing Seattle in person didn’t quite match my expectations. I imagined a centralized city where most people had easy public transit access to the city center, kind of like what we have in the big cities in the Mid-Atlantic and Northeast. Instead, it was pretty decentralized, with neighborhoods sprawled out from the downtown. Ignoring the steep hills and the cold weather, it kind of reminded me of the southern cities I grew up around. I know it’s a cliché to say that Seattle is cloudy and dreary, but, wow, it was both of those things and then some. Even after the record rainy and cold weather we experienced in DC in May, I wasn’t prepared for the chilly weather. With the clouds hanging low, and visibility reduced, I felt like I could barely see the city – never mind the Cascades. Still, even with mist in the air and heavy cloud coverage, there was something beautiful about Seattle. 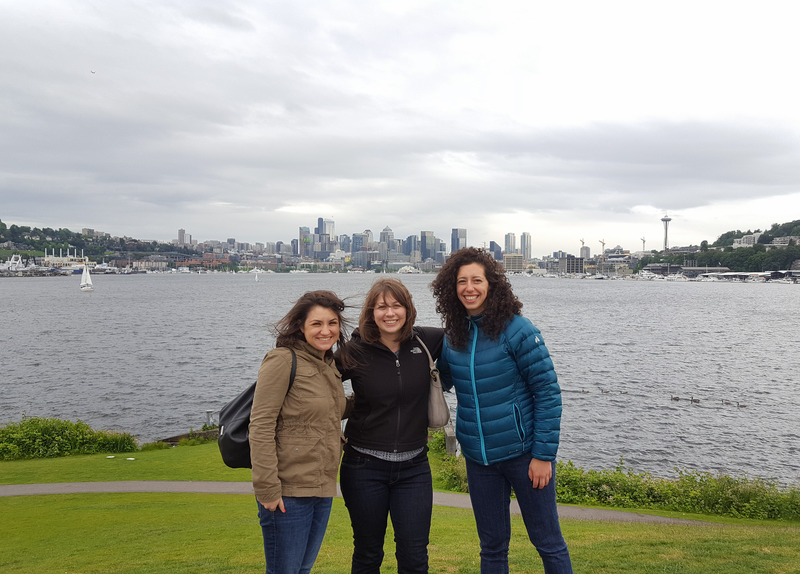 Becky took us all over the city – to Gas Works Park, Ballard Locks, and Kerry Park. We visited the famous Pike Place Market, marveling at the gum wall and getting a fish tossed right in front of us; we climbed up the back of the Fremont Troll; sipped on deconstructed lattes at Slate Coffee Roasters; and sampled delicious treats at Theo Chocolate. Even with the gloomy weather, we had an awesome time exploring the city. 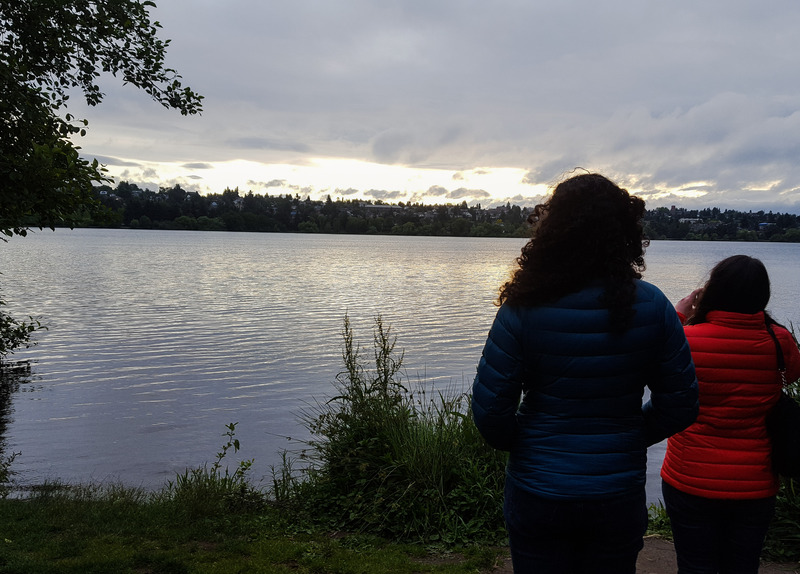 Becky lives in the Green Lake neighborhood, and knowing my love of the trail, she made a point to take us around the lake on our way to dinner. We paused at the water as the sun set, watching the lights wink on in the homes around the lake. It was such a peaceful sight. For the first time, I could really see why people gravitate to this part of the country. Per Becky, this jacket is Seattle’s uniform. We were only in Seattle for three days, and based on the weather forecast, it seemed like we wouldn’t have the opportunity to even catch a glimpse of Washington’s storied mountains. But the day after the wedding, our last day in Seattle, I woke up, looked out the window, and saw nothing but blue sky. We’d reserved our last day in the city to do the most touristy of touristy things: The Space Needle. Mindy and I stayed in a hotel room the night of the wedding so we set out sans Becky for the first part of this outing. 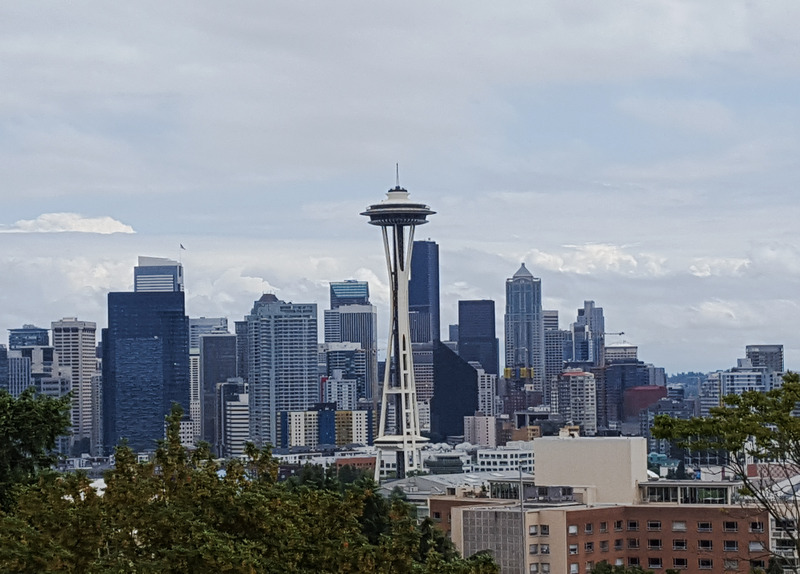 As we got close to it, Mindy realized that her fear of heights was way stronger than her desire to go up the Space Needle, but I couldn’t imagine coming all the way across the country and missing out on this super touristy activity. With Mindy’s blessing, we parted ways. She went on to explore a random festival at the base of the Space Needle and I bought a ticket and hopped in line eagerly waiting to get to the top. On such a beautiful, clear day, it was beyond worth it. I piled into the elevator with a bunch of other tourists. As we ascended to the observation deck, I saw it. On the horizon, Mount Rainier emerged from behind the city. I think seeing it literally took my breath away. I’ve obviously been in the shadow of mountains before, but I don’t think I’ve ever seen anything quite like Mount Rainier. There was something so majestic about the way its snow covered peak emerged from behind Seattle’s skyline. Knowing that it was far away and still looked massive on the horizon – I don’t know if I’ve ever seen a mountain of that size before. As I walked around the observation deck, I kept coming back to the mountain. I couldn’t stop photographing it. I didn’t want to stop looking at it. When I finished with the observation deck and had to come back down to reunite with Becky and Mindy I was actually a little sad to lose sight of the mountain. Thankfully, I had another opportunity to get a view of Mount Rainier. 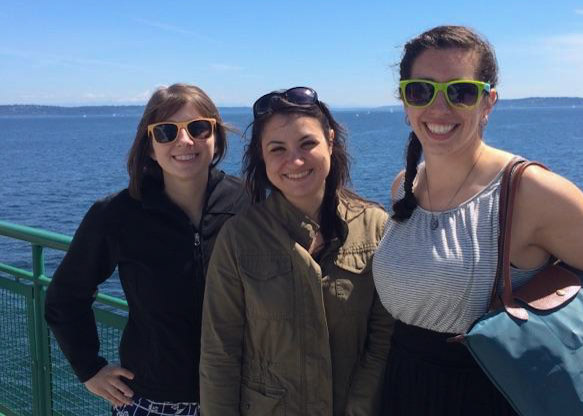 After leaving the Space Needle, we headed over to the ferry terminal to catch a boat to Bainbridge Island. Crossing Puget Sound, we had another striking view of the mountain. I wanted to be on it. This is a new one for me. I’ve never felt an instant connection with a mountain before. But then again, I’d never seen anything quite like Rainier. Truthfully, I’m not even sure that I want to climb to the top of Rainier. Since my return home, I’ve done my research, and while Mount Rainier is no Everest, it has enough scary things going for it to be terrifying in its own right. Sure, it’s “only” 14,411 feet high, but it’s also an active volcano. It can literally blow. Ignoring the magma and lahar factors, I’m way too risk adverse to take on ice climbing and fixing ropes. But even though summiting is antithetical to anything that I can ever imagine myself doing in my lifetime, I can’t stop thinking about the mountain. I want to see Rainier again. I want to put my boots on its ground and hike it to the point where I can’t get any higher. Is this the same feeling that keeps Everest climbers up at night? Is this what drives them to save a fortune and train for an expedition that might kill them? Is this even a fraction of what it’s like to have a pull toward a mountain that’s like the force of gravity? If I saw Everest, would all of my fears be erased and replaced with an all-consuming desire to get to the top? The other side of this country is far away, so I don’t know when I’ll make it back to Washington and Mount Rainier. But unlike Everest, which I’m planning on keeping my distance from, this is a mountain that seems within my reach. Count one more for my bucket list, I’m going up (part of) Mount Rainier. Fact: My head is covering the mountain. Thanks you! I’m touched by the compliment. Yes, please! If the description didn’t get me, those pictures…wow! You captured growing up in Florida and the awe of anything mountain or winter related perfectly! Haha – we were so ignorant about winter weather. How disappointed were you when you discovered snow was super wet? I’m still sad about it 12 years later.